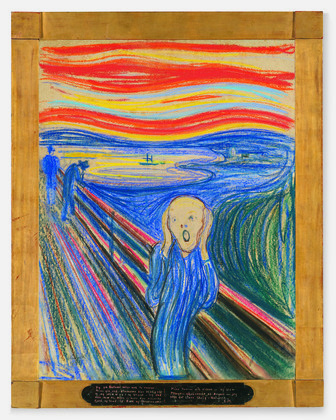 Maybe it’s a bridge and not a coastal boardwalk, but the character in Munch’s pastel on view at MoMA through April 2013 pretty much sums up the experience of so many Tri-State residents in the last week. Ironically, the privately owned drawing went up only a few days before the hurricane stormed through the region, devastating homes, beaches, and the Chelsea galleries. Many downtown museums remain closed, including the South Street Seaport Museum, the New York City Police Museum, the National Museum of the American Indian, and the Skyscraper Museum, although the Museum of Jewish Heritage at the Battery has just announced its reopening. On the West Side, the Intrepid is closed until it can fix its inundated welcome center and repair the outdoor protective bubble around the space shuttle Enterprise, which got a little beat up. The High Line is repairing all of its electrical infrastructure. To help the arts and museum community during this difficult week, MoMA has posted a PDF with instructions on conserving art works that have sustained flood damage and held a workshop with conservators from the American Institute for Conservation Collections Emergency Response Team for afflicted dealers and collectors this past weekend. While the repairs and restoration will take time and with another windy storm on the way toward New York, Mr. Munch’s 117-year-old evocation remains pretty much on point. This entry was posted in Art, Museums, Nature and tagged art, culture, nature by mssusanb. Bookmark the permalink.